Category: Hardware and Software. Tags: itx, linux. This PC is built into a very simple case: a ring binder. The PC is anembedded controller – not used by humans but independently doing its specialunsupervised job. In this case it wakes up once a day, takes a picturewith a USB camera, stores it and then powers off again. As an embedded controller this PC is headless (no keyboard, nodisplay). A PC usually has a hard disk, in this case I use a USB memorypen instead. The pen’s memory of 64MB is divided into one MS-DOS andone ext2 partition. The MS-DOS-partition stores the kernel and rootfile system and boots via Syslinux. The second partition is used forpicture storage. The memory-pen is now and then temporarily moved to anordinary PC to transfer stored pictures. The operating system is Linux kernel 2.4.21 supportedby Busybox utilities and uClibc library. 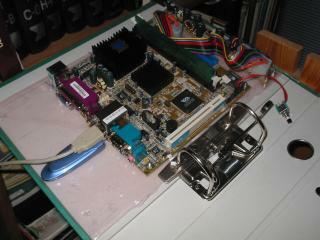 The main board (VIA EPIA-5000) and an accompanying 12VDC to ATX-powerconverter are screw-mounted onto an acrylic sheet. Thesheet is set into the ring binder like a paper sheet. The binder can then beplaced on a book shelf. The PC is only on for a few minutes every dayso heat is not a problem. However, heat production is an issue if thePC for some reason (e.g. program crash) does not turn itself off. Thisparticular main board is of a low power type designed to be run without a fan, soeven long on-times will be harmless. The unfolded PC, central: motherboard. left USB memory pen and USB-cable for the camera, right: 12VDC power converter. The binder seen from above and from the front.